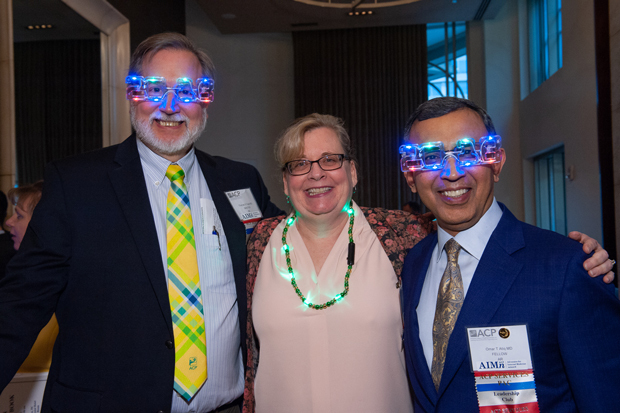 Leadership Day 2018 hosted more than 350 ACP members and guests to meet with nearly 100 members of Congress and staffers to address seven key issues important to internal medicine. 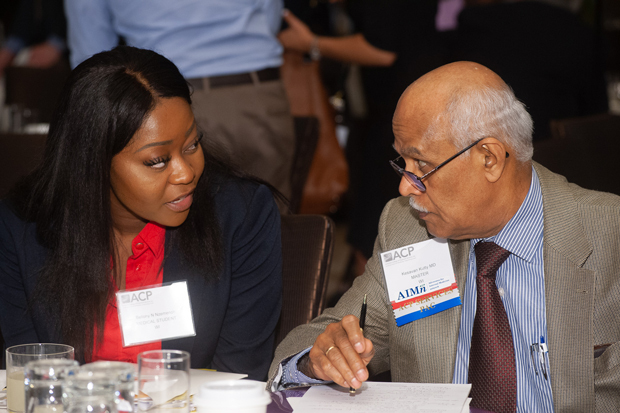 In the past year, Congress may not have taken as much action as expected on health care, but ACP was still busily pursuing legislative improvements. 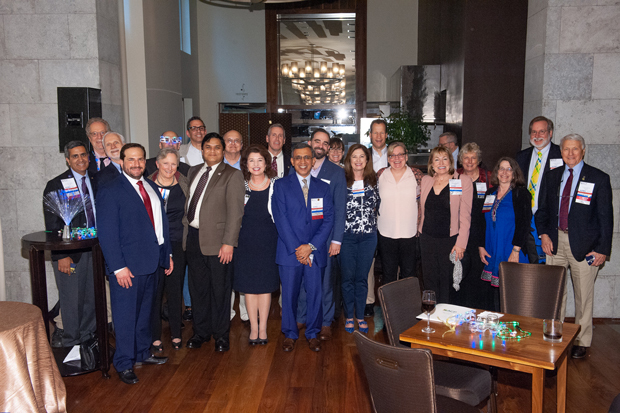 During Leadership Day 2018, about 354 attendees from 48 states, Washington, D.C., and Ontario, Canada, met with 94 members of Congress during about 400 meetings on Capitol Hill. 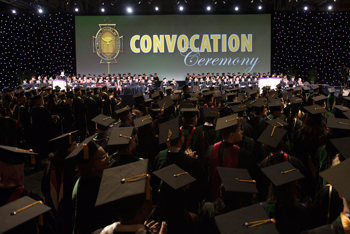 More than one-third of all attendees were medical students, residents, and fellows in training. The ideas they planted during the annual visits to legislators pertained to seven key issues: 1) expanding insurance coverage and stabilizing the market, 2) reducing unnecessary administrative tasks for physicians and patients, 3) reducing prescription drug costs, 4) funding workforce, medical, and health services research and public health initiatives, 5) promoting continued efforts to address the epidemic of opioid misuse, 6) reducing injuries and death related to firearms, and 7) making graduate medical education funding more effective. 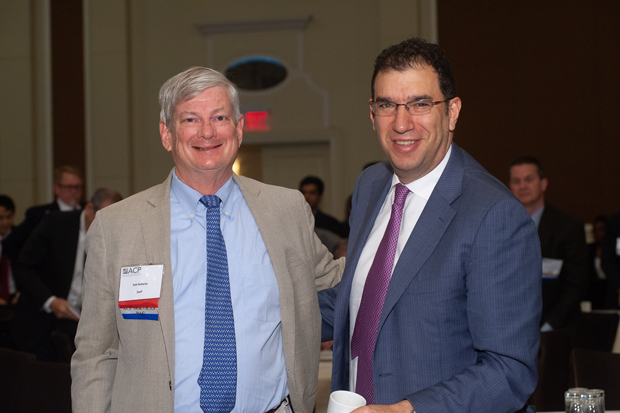 Former acting administrator of CMS Andrew M. Slavitt, MBA, highlighted how politics poses obstacles to accomplishing these goals when he spoke to ACP members after accepting the College's Joseph F. Boyle Award for Distinguished Public Service. 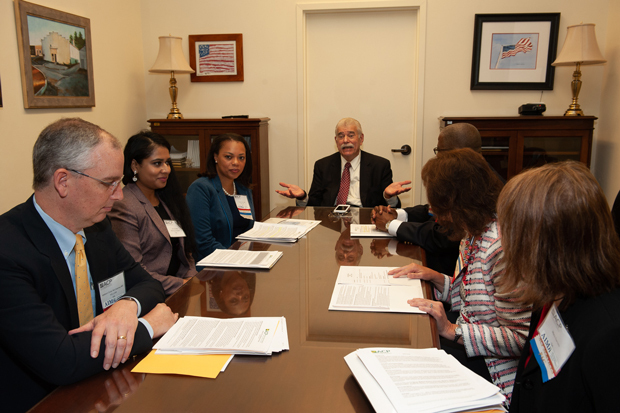 Mr. Slavitt told ACP members to keep their message simple for politicians, who are not necessarily health care experts. “You can go a long way with one rule of thumb, which is if a policy helps people get health care, it's good; if it makes it harder for somebody to get health care, it's bad,” he said. Of course, some issues are more contentious than others. As they met with members of Congress, the internists, residents, and students who represented the College focused on three main priorities that have enjoyed bipartisan support: reducing administrative burdens, addressing the opioid epidemic, and reducing prescription drug costs. 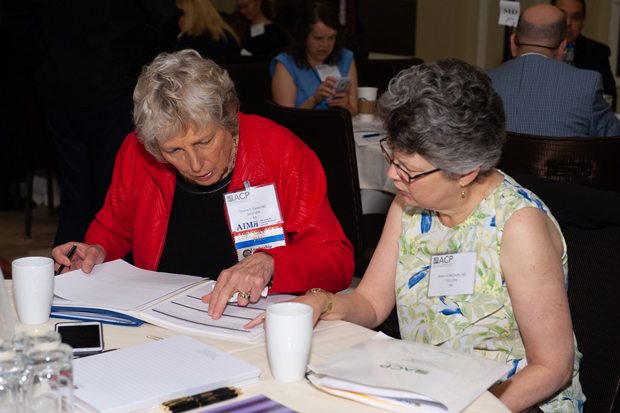 ACP's Patients Before Paperwork initiative, established in 2015, sounds a lot like CMS’ Patients over Paperwork initiative, which launched last year. “Whether it's ‘over’ or ‘before,’ it's the same thing,” noted Mr. Doherty. Both efforts aim to reduce unnecessary burdens and increase efficiency while improving the patient experience. At the Louisiana Chapter's meeting with Sen. Bill Cassidy, MD (R-LA), ACP Resident/Fellow Member Farnaz Shariati, MD, said that while the electronic health record was meant to make work easier, clinicians now spend up to five hours per week on billing activities and up to 15 hours per week on quality measures and documentation. “The amount of work they have to do … it takes away from the relationship between the patient and the doctor,” she said. The prior authorization process is a good example of this burden, Richard J. Seitz, MD, FACP, told Rep. Jeff Fortenberry's (R-NE) staff. “So much of it is duplicative and just makes no sense,” he said. 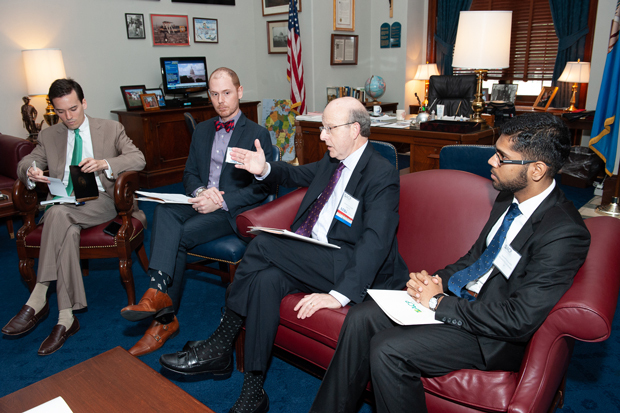 To address this issue, ACP supports the Standardizing Electronic Prior Authorization for Safe Prescribing Act, which has made progress in the House this year and would enable electronic prior authorization for drugs covered under Medicare Part D.
Another issue that came up at the Nebraska Chapter's Capitol Hill visit was addressing the opioid crisis, which received $4.65 billion in funding as part of this year's omnibus appropriations bill. This $3 billion increase in federal funding included $360 million in programs authorized by the Comprehensive Addiction and Recovery Act (CARA) of 2016. 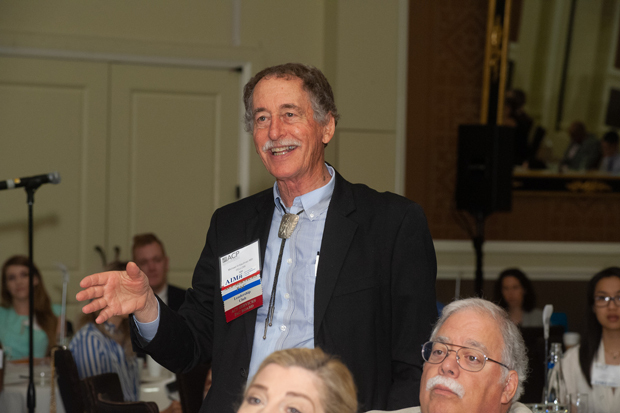 “ACP is really behind the idea of reauthorizing the CARA legislation,” said Thomas G. Tape, MD, MACP, Immediate Past Chair of ACP's Board of Regents. The CARA 2.0 Act of 2018 would reauthorize the program for five more years and give $1 billion to evidence-based prevention, enforcement, and treatment programs. Although it's important to combat opioid abuse, there is danger in the pendulum swinging too far and preventing access, said Michael S. Bronze, MD, MACP, ACP Governor for Oklahoma, which has one of the highest rates of prescription painkiller sales per capita. “The fixes should not include things that would make it difficult for doctors to care for patients who really need them,” Dr. Bronze said in the chapter's meeting with Sen. Jim Inhofe's (R-OK) office. 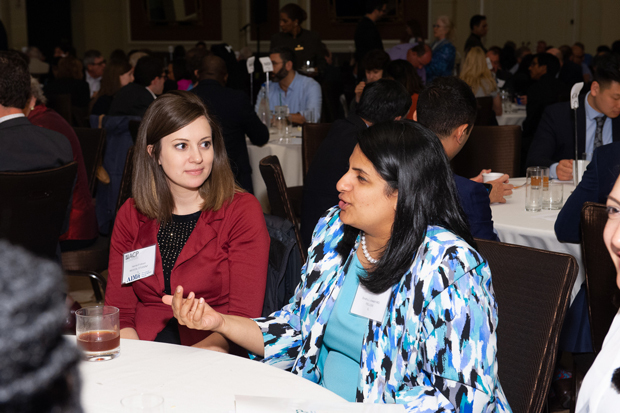 Finally, following the White House's May announcement of a plan to help reduce prescription costs, the issue of drug prices was once again a hot topic at Leadership Day. “That the president is engaging on this is very good news … but it's not enough,” said Mr. Doherty. Several physicians shared compelling stories about patients' difficulties affording their medications. Soma Wali, MD, FACP, told Rep. Ami Bera, MD, FACP (D-CA), that while walking to his office building, she encountered a preschool teacher who said her prescription costs $100,000 per year—twice her salary. “We have to do something about this,” she said. 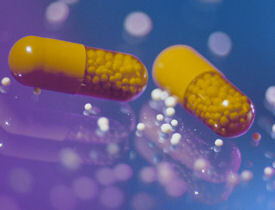 Stephanie Wang, MD, ACP Resident/Fellow Member, added that many patients with chronic conditions take five to eight medications that, even if relatively affordable on their own, add up to cost too much. “Patients shouldn't have to choose between feeding their families and taking their medications,” she said. To address this problem, ACP supports the Drug-Price Transparency in Communications Act, which would require drug companies to disclose the wholesale acquisition cost of medications in direct-to-consumer advertising. The College also supports the Creating and Restoring Equal Access to Equivalent Samples (CREATES) Act of 2017, which would improve access to low-cost prescriptions by making it easier for competing generics to enter the market. 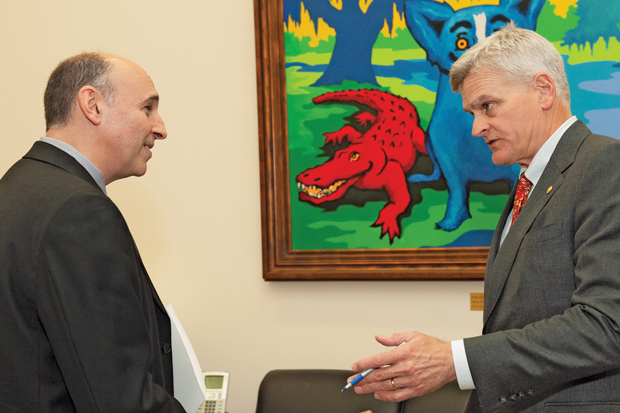 David M. Borne, MD, FACP, brought the issue of generic pricing to life during his meeting with Sen. Cassidy. In New Orleans, two of his patients recently told him their insulin was stolen. “I said, ‘You've got to be kidding.’ … That's the first insulin thief I've ever heard of,” he said, noting that the price of the drug has increased to about $400 per month.